Urban poor are those people residing in urban areas, who cannot fulfil their family needs in open urban consumer market due to low wages, under employment or unemployment. There is gap between income and fulfilment of needs; hence their living standard is low in comparison with other urban population. Hence, to have affordable housing , food, work and health facilities, they create their own settlement called, invisible cities, informal cities, slums etc. Efforts for poverty alleviation in developing countries are generally directed towards rural areas. This is based on the empirical evidence of poverty in developing countries being concentrated in rural areas. However, along with economic growth and its consequent impact on urbanisation, the nature of poverty in developing countries also follows a gradual shift from being predominantly concentrated in rural areas to shifting gradually to urban areas. The world’s urban poor are worse off than their rural relatives, According to a report by UN-Habitat, the UN’s human settlement programme; it is a myth that urban populations are healthier, more literate or more prosperous than people living in the countryside. The report provides data that shows that the world’s one billion slum dwellers are more likely to die earlier, experience more hunger and disease, attain less education and have fewer chances of employment than those urban residents that do not reside in a slum. But the report also cites examples of how good housing and employment policies can prevent slums from growing. The world is entering a historic urban transition. In the last half century, the world’s urban population has increased nearly fourfold, from 732 million in 1950 to more than 3.2 billion in 2006. Africa now has 350 million urban dwellers, more than the populations of Canada and the United States combined. Asia and Africa are expected to double their urban populations to roughly 3.4 billion by 2030 (State of the World, 2007). For the first time in history of the world, more people live in cities than in rural areas, thus making urban poverty one of the most important, yet most overlooked issues of the 21st century The huge numbers of people living in towns and cities and the increasing proportion living in slums will present the 21st century with its most important health challenge. Of the 3.2 billion urban dwellers today, it is estimated that 1 billion population live in ‘slums’, and remain socially, politically and economically excluded. Slums in poor cities are growing by 100,000 people per day – one person every second. The United Nations Agency UN-HABITAT defines a slum as a heavily populated urban area characterized by extremely poor housing and squalor, usually inhabited by the very poor or socially disadvantaged. Unable to afford housing many populations build their homes on empty government land or vacant private land, with serious overcrowding, congestion and little to no access to basic facilities. Buildings are usually simple shacks made of flimsy structures with a few well maintained structures. 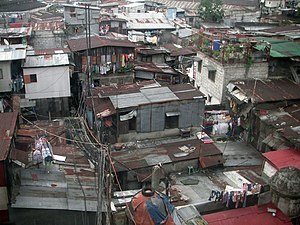 Basic services such as water, sanitation and proper drainage needed for good health often do not reach the urban poor living in slums because municipal authorities do not recognize many informal settlements, shanty towns for political and administrative reasons thus making them ineligible for services (UN-HABITAT, 2003). The lack of legal recognition means not only the absence of basic services – such as water, sanitation, garbage removal, health care services, but also accessing such services means paying much more than the affluent neighbors in the city. Furthermore, being a slum dweller often means the absence of health surveys and even a census on which to document the extent of the need of these populations (Vlahov et al, 2006). Aside | This entry was posted in Human Geography, opinions, Urban Studies. Bookmark the permalink.